The essential basis of our approach is knowledge and experience in the field of waxes, their properties and their effectiveness. Our technical service will be pleased to give advice on well-known application areas and to open up new chances and opportunities in cooperation with the customer. 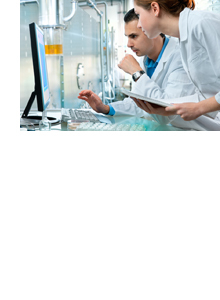 An efficient laboratory staff is on hand to provide analyses and application-related tests and evaluations. The practical work is supported by product documentation that is continually updated and takes into account international standards and legal regulations.